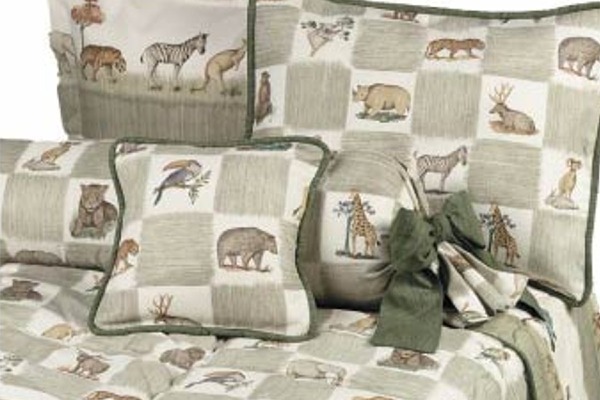 Items Shown on this Twin Bed: AK30 Twin Comforter, AK37 Gathered Dust Ruffle (Now comes tailored in the walking print), AK41 Twin Bolster (Ties now come in the square print), AK4314 14" Square Throw Pillow, AK45S Euro Style Sham Animal Walking Print, AK40 Corded Sham. Items Shown in this Crib: AK1 Crib Quilt, AK3 Fitted Sheet (now comes in the square print), AK4 Hollywood Bumper, AK2 Crib Pillow. The Lamp has been discontinued.